Winston Leonard Spencer Churchill was born on November 30, 1874, at Blenheim Palace—a home given by Queen Anne to Churchill's ancestor, the Duke of Marlborough. He was the eldest son of Lord Randolph Churchill, a Tory Democrat (a British political party) who achieved early success as a rebel in his party. Later, after Randolph Churchill failed, he was cruelly described as "a man with a brilliant future behind him." His mother was Jenny Jerome, the beautiful and talented daughter of Leonard Jerome, a New York businessman. Winston idolized his mother, but his relations with his father, who died in 1895, were cold and distant. It is generally agreed that as a child Winston was not shown warmth and affection by his family. As a child Churchill was sensitive and suffered from a minor speech impediment. He was educated following the norms of his class. He first went to preparatory school, then to Harrow in 1888 when he was twelve years old. Winston was not especially interested in studying Latin or mathematics and spent much time studying in the lowest level courses until he passed the tests and was able to advance. He received a good education in English, however, and won a prize for reading aloud a portion of Thomas Macaulay's (1800–1859) Lays of Ancient Rome (1842). After finishing at Harrow, Winston failed the entrance test for the Royal Military College at Sandhurst three times before finally passing and being allowed to attend the school. His academic record improved a great deal once he began at the college. When he graduated in 1894 he was eighth in his class. Very early on Churchill demonstrated the physical courage and love of adventure and action that he kept throughout his political career. His first role was that of a soldier-journalist. In 1895 he went to Cuba to write about the Spanish army for the Daily Graphic. In 1896 he was in India, and while on the North-West Frontier with the Malakand Field Force he began work on a novel, Savrola: A Tale of the Revolution in Laurania. The book was published in 1900. More important, however, were Churchill's accounts of the military campaigns in which he participated. Savrola was followed by a book about the reconquest of the Sudan (1899), in which he had also taken part. As a journalist for the Morning Post, he went to Africa during the Boer War (1899–1902), where British forces fought against Dutch forces in South Africa. The most romantic of his adventures as a youth was his escape from a South African prison during this conflict. In 1899 Churchill lost in his first attempt at election to the House of Commons, one of two bodies controlling Parliament in England. This was to be the first of many defeats in elections, as Churchill lost more elections than any other political figure in recent British history. But in 1900 he entered the House of Commons, in which he served off and on until 1964. Churchill's early years in politics were characterized by an interest in the radical reform (improvement) of social problems. The major intellectual achievement of this period of Churchill's life was his Liberalism and the Social Problem (1909). In this work he stated his belief in liberalism, or political views that stress civil rights and the use of government to promote social progress. Churchill was very active in the great reforming government of Lord Asquith between 1908 and 1912, and his work fighting unemployment was especially significant. Churchill suffered a major setback. He became committed to the view that the navy could best make an impact on the war in Europe (1914–18) by way of a swift strike through the Dardanelles, a key waterway in central Europe. This strategy proved unsuccessful, however, and Churchill lost his Admiralty post. In 1916 he was back in the army, serving for a time on the front lines in France. Churchill soon reentered political life. He was kept out of the Lloyd George War Cabinet by conservative hostility toward his style and philosophy. But by 1921 Churchill held a post as a colonial secretary. A clash with Turkish president Kemal Atatürk, however, did not help his reputation, and in 1922 he lost his seat in the House of Commons. The Conservative Party gained power for the first time since 1905, and Churchill began a long-term isolation, with few political allies. In 1924 Churchill severed his ties with liberalism and became chancellor of the Exchequer (British treasury) in Stanley Baldwin's (1867–1947) government. Churchill raised controversy when he decided to put Britain back on the gold standard, a system where currency equals the value of a specified amount of gold. Although he held office under Baldwin, Churchill did not agree with his position either on defense or on imperialism, Britain's policy of ruling over its colonies. In 1931 he resigned from the conservative "shadow cabinet" in protest against its Indian policy. Churchill's years between world wars were characterized by political isolation. During this period he made many errors and misjudgments. Chief among these was his warlike approach to the general strike of 1926. Thus, he cannot be viewed simply as a popular leader who was kept waiting in the wings through no fault of his own. The major period of Churchill's political career began when he became prime minister and head of the Ministry of Defense early in World War II, when British and American Allies fought against the Axis of Germany, Italy, and Japan. "I felt as if I was walking with destiny, and that all my past life had been but a preparation for this hour," Churchill wrote in the first volume of his account of the war. (This account was later published in six volumes from 1948 to 1953.) His finest hour and that of the British people came at the same time. His leadership, which was expressed in noble speeches and constant personal activity, stated precisely what Britain needed to survive through the years before the United States entered the war. The evacuation of Dunkirk and the air defense of the Battle of Britain became legend, but there were and are controversies over Churchill's policies. 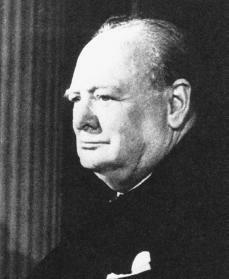 It has been argued that Churchill was too sensitive to the Mediterranean as a theater of war, which led to mistakes in Crete and North Africa. The value of his resistance to the idea of a second front as the Germans advanced into Russia has also been questioned. And there has been considerable debate over the courses he pursued at international conferences, such as those at Yalta in February 1945. Many believed some of Churchill's policies were responsible for the "cold war" of the 1950s and 1960s, where relations between Eastern Communist powers and Western powers came to a standstill over, among other things, nuclear arms. Although criticisms may be made of Churchill's policies, his importance as a symbol of resistance and as an inspiration to victory cannot be challenged. The final period of Churchill's career began with the British people rejecting him in the general election of 1945. In that election 393 Labour candidates were elected members of Parliament against 213 Conservatives and their allies. It was one of the most striking reversals of fortune in democratic history. It may perhaps be explained by Churchill's aggressive campaign combined with the British voters' desire for social reconstruction. In 1951, however, Churchill again became prime minister. He resigned in April 1955 after an uneventful term in office. For many of the later years of his life, even his personal strength was not enough to resist the persistent cerebral arteriosclerosis, a brain disorder, from which he suffered. He died on January 24, 1965, and was given a state funeral, the details of which had been largely dictated by himself before his death. There is little doubt that Winston Churchill was a political figure of enormous influence and importance. His record, both before 1939 and after 1945, was for the most part undistinguished. But as Anthony Storr writes: "In 1940 Churchill became the hero that he had always dreamed of being.… In that dark time, what England needed was not a shrewd, equable, balanced leader. She needed a prophet, a heroic visionary, a man who could dream dreams of victory when all seemed lost. Winston Churchill was such a man." Charmley, John. Churchill, The End of Glory: A Political Biography. New York: Harcourt Brace, 1993. Churchill, Winston S. Memories and Adventures. New York: Weidenfeld and Nicolson, 1989. Gilbert, Martin. Churchill: A Life. London: Heinemann, 1991. Manchester, William. The Last Lion: Winston Spencer Churchill, Alone 1932–1940. Boston: Little, Brown, 1988. Manchester, William. The Last Lion: Winston Spencer Churchill, Visions of Glory, 1874–1932. Boston: Little, Brown, 1988.